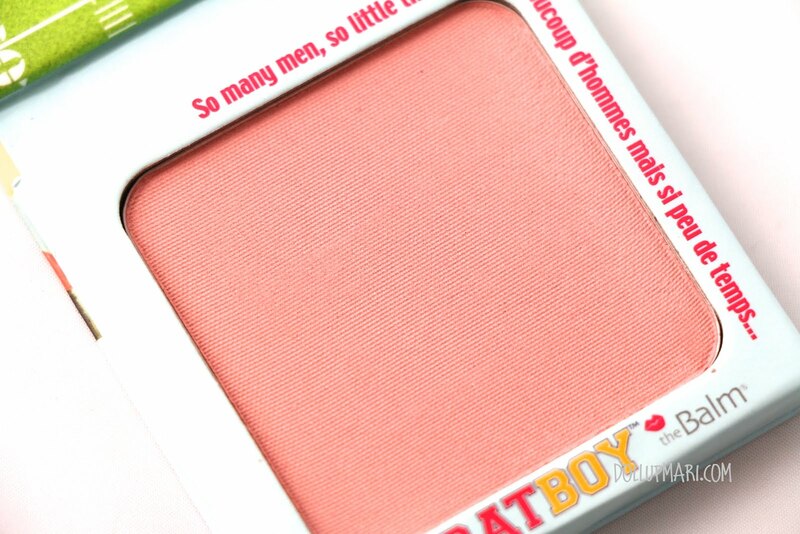 Yes, there'll be plenty of men to choose from once this blush is on your face! 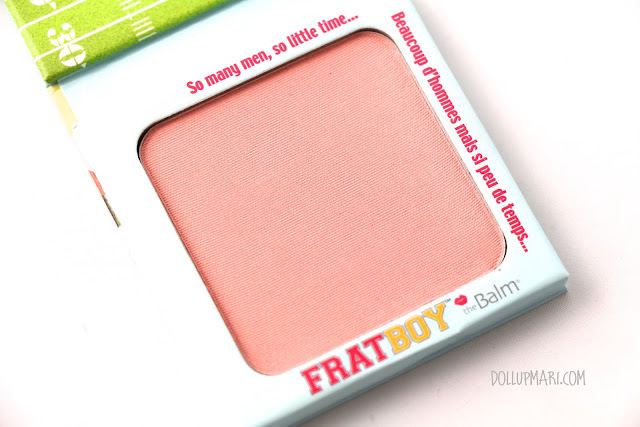 Today's review is about the Balm's Frat Boy blush. 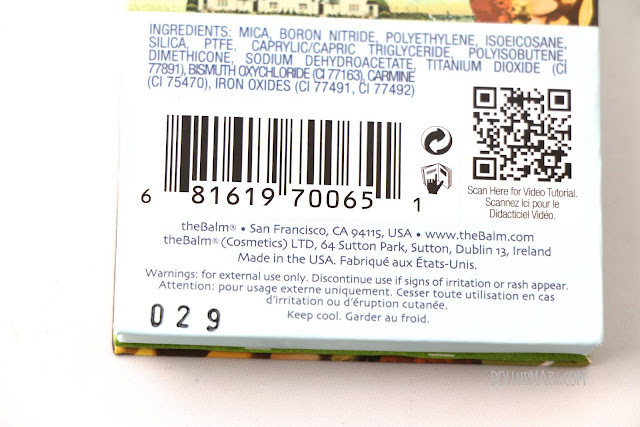 the Balm really is the world's most underrated makeup brand because they should definitely be bigger than they currently are with all the really great products they have! 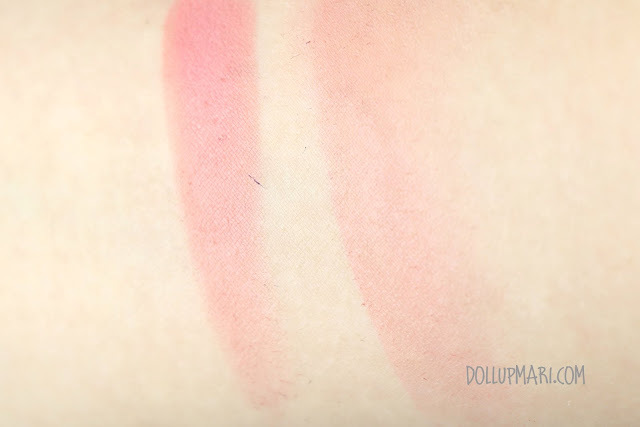 Let me talk about this blush in more detail. 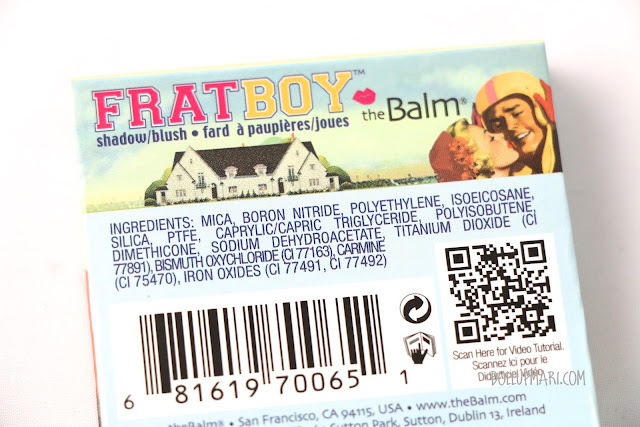 So like the other the Balm blushes, this also comes in a sleeve with the exact same design. I love this feature because the store can stick all their stickers and price tags and not make the product itself tacky once the stickers are removed. These are the ingredients of the product, for those interested. And what I like is that it's made in the USA yet comes in a relatively reasonable price! It's got this magnetic clasp and comes with a reasonably sized mirror. I won't really rely on this all the time, but I personally find this a nice feature of the product. Color wise, it's a peach color with a touch of brown. It's leaning toward this red orange shade, but by no means is it that dark. It's still got touches of pink, and is not strongly red orange. And I guess you must've noticed by now that the pan is really generous and really big. It's as big as a credit card in terms of surface area, but is shaped like a square. I was shopping at Beauty Bar when I saw this and fell in love immediately because when I tried it, I realized that it was very very buildable. You can dust this on very very lightly for a slightly blushing effect, but build it up for a more dramatic look or for when you're going to be in a high lighting situation. This is the arm swatch to illustrate what I mean. You can see that it's already nearing opaqueness on the left stripe, but you can see a just a rosy glow on the right stripe when applied thinly feathered out. Hot Mama! is pretty and all, but I personally find this more appropriate for wedding makeup as it's matte. 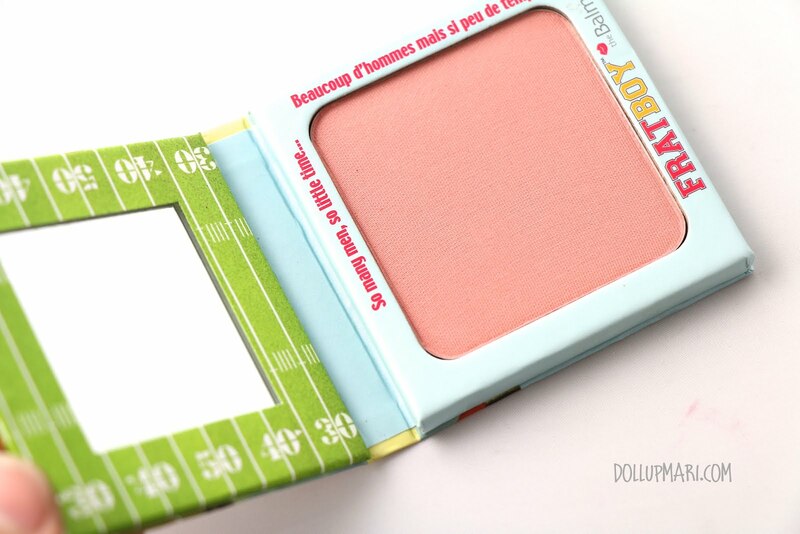 The blush looks really pretty, and gives the cheeks a nice warm glow. I also realized its strong staying power because when I was going to put this blush on, I had another product on my cheeks. I simply swiped the product off and dusted with powder and moved on with my life. 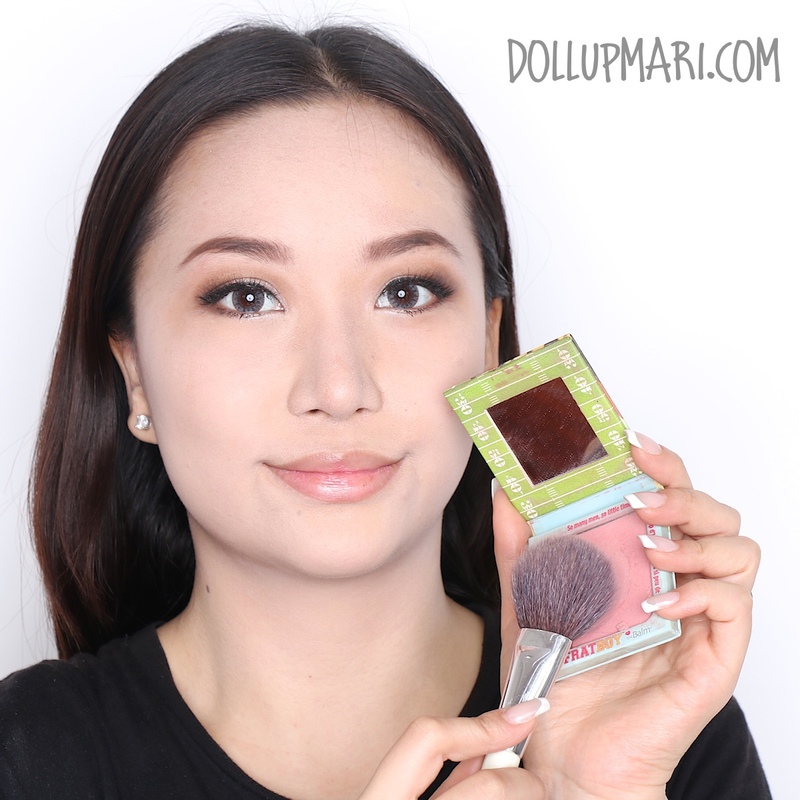 But with this blush, as I was already about to transition into another blush, it took much effort to wipe this off with tissue, and I had to dust sooooo much face powder before the color had even faded slightly. I decided to just swatch the other blush on another occasion as my cheeks were still very very full of this blush. It's truly the kind of blush that I can trust for brides. And even in hot and humid conditions this blush cooperates, too. I have worn this blush on several occasions with no air conditioning and the blush has cooperated and stayed put for about eight hours. You can expect it to stay even longer in less hot and humid conditions. 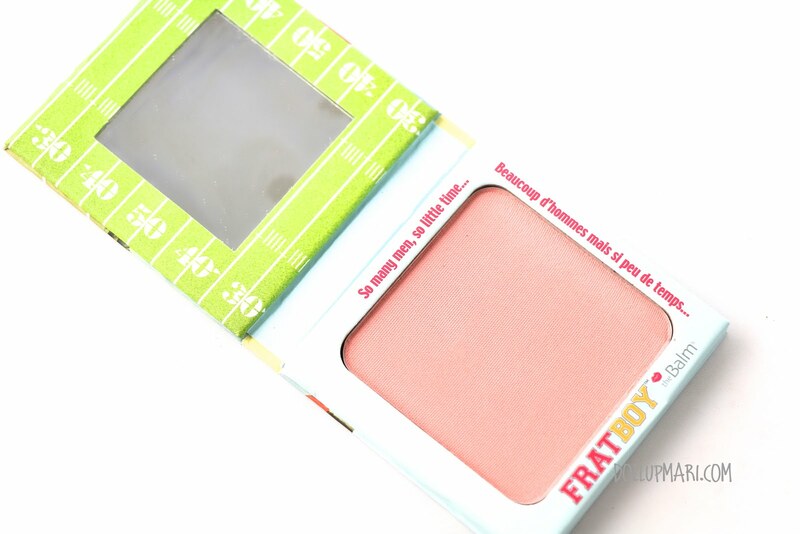 I got this blush for Php850 from Beauty Bar. I think it's pricier than Hot Mama! as its pan is bigger. As for value for money, given the really big pan and its extreme staying powder and longevity, I highly recommend this to everyone. This is also half the price of other blushes of similar quality so this is definitely a good buy. I also highly recommend this as a first timer's blush purchase as this is a buildable blush and is easily controllable, and also due to what I mentioned about its large pan and staying power. What do you think is the most underrated makeup brand out there? Please do tell me in the comments box!